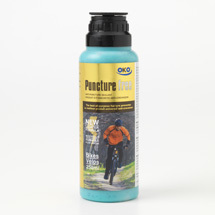 OKO Puncture Free Bike is a water-based liquid that is able to work on both tubed and full UST tubeless tyres. It gives peace of mind and lasting security for the tyre’s life, with a dose of 60-100ml per tyre in mainstream bikes, depending on size. An all-purpose product for commuting, touring and weekend mountain bike tube use (and perfect for peace of mind on your e-bike). 250 ml bottle deals with one large bike with some to spare: for 26” MTB tyres it is now just 100ml per tyre, up to 20% less weight than any recognised competitor. It’s a really economical way of ensuring peace of mind, for a fraction of the cost of replacing just one tyre. Simple fitting, using the valve core remover and Schräder valve-sized filling tube supplied in every bottle cap: or use an OKO Tyre Sealant Injector for easy, accurate measuring. 25 litre drum is ideal for retailer and team service workshops: the NEW heavy-duty all-alloy drum pump is a one-time purchase and can be rinsed out again and again for repeated use in filling tyres rapidly. It uses the unique OKO Bike drum pump with adjustable dosage, plus it has Schrader and Presta screw fittings. (For ‘Tubeless Ready’ tyres, use a rim strip and OKO Magic Milk™, which is the lightest and best sealant to seal the bead/rim gaps and the porous sidewalls). Colour: Blue. Viscous. Low Odour. For maximum accuracy, for easier use with removable Presta valves, and for a host of workshop uses, use the OKO Tyre Sealant Injector.